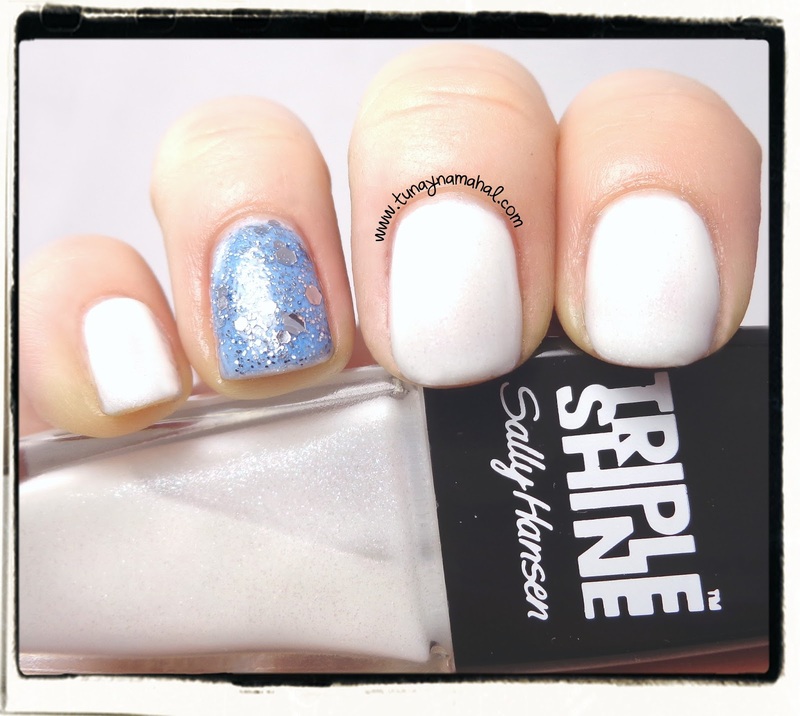 I picked up 8 of the new Sally Hansen Triple Shine polishes about 3 weeks ago from CVS. I've had the pictures in my camera, but I wasn't able to edit and upload them without my laptop. I spent most of Saturday installing all my programs and files into my new Sony Vaio. And last night I was finally able to start editing the photos. 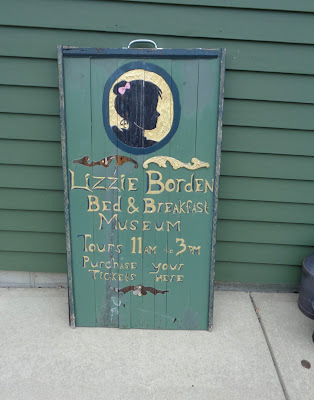 I'm so happy to be back to blogging! I lost all of my downloaded fonts when my laptop crashed, so I had to create a new watermark with a new font. And I finally figured out how to do a curved watermark in Paintshop Pro XI! Whoo Hoo! First up is, Make Waves. This is my favorite out of all the polishes I bought. It's a gorgeous blue green duo chrome. I needed 3 coats to make it opaque. I also used one coat of Seche Vite. 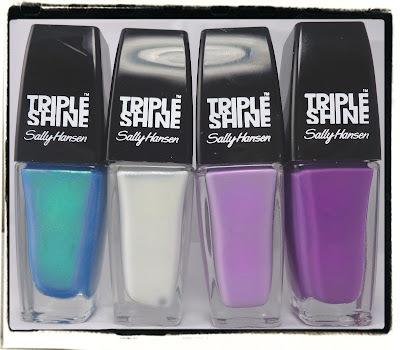 (Sally Hansen also makes a Triple Shine topcoat). I've also seen this colored layered over white and it looks just as pretty, if you don't feel like doing all those coats. Slick Black has silver and even green micro shimmer in it. It kind of has a gun metal look. I only used 2 coats of this and 1 coat of topcoat. I layered Spark's Fly on my ring finger. Vanity Flare is a gorgeous bright grape color with lot's of shine. It almost looks like vinyl. I used 2 or 3 coats, (I can't quite remember), plus topcoat. Sparkling Water I did 2 coats and 1 coat of topcoat. Gorgeous blue green turquoise color! Wavy Blue is a deep bright blue. This is 2 coats plus 1 coat of topcoat. The formula was a bit thick on this one. I think Drama Sheen would best be layered over something. This is four coats, plus topcoat and even then you can still see my nail line because it's so sheer. It's a very sheer purple/pink duo chrome. I really want to like Great White... this is four coats, plus topcoat. It's rather hard to work with, very streaky. I think it would do best layered over a solid white. It's such a pretty white too, it has silver, pink & green micro shimmer in it. Spark's Fly is on my ring finger. I got a new light box! The Mercurial Magpie posted about hers a few weeks back and I asked where she had gotten it. 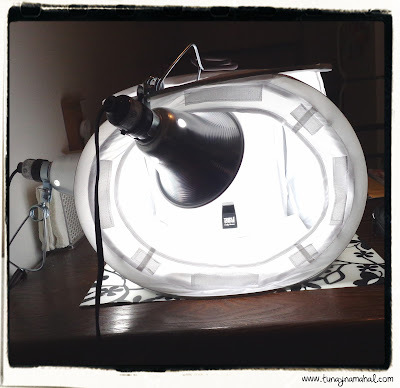 It's a 12 x 12 portable light box with 4 different backgrounds. I bought it on Amazon.com. It's pretty sturdy for being made out of fabric too.